Something’s happening here. What it is involves numerous containers made from woven plant fibers. These are called baskets, and they have proliferated in nearly every room of the house. It started innocently enough. A pile of semi-related stuff would form and, voila, suddenly there it was all gathered up tidily together in a basket. Lovely. These woven containers are on shelves, on the floor, and even hang on the wall. Some are heart shaped. Most are rounds, oblongs, or rectangles. And they are of multiple sizes. They hold cards, food, trash, clothing, and more. Items I kept on a nightstand near the bed are now neatly tucked away in a small heart-shaped basket. A reedy reminder of my wife’s love. On one side of the bathroom sink is a manly metal basket with my items in it, and on the other side is a larger, natural and more pretty basket with her stuff. We have baskets that act as trash cans and one that is a clothes hamper. Although, for some reason, larger woven containers, while they look just like big baskets, are usually referred to as wicker. This is a code I don’t understand. A basket by any other name is wicker? Whatever. I’m really not too opposed to all these baskets being woven into the fabric of our life. The organization they offer appeals to my own sense of orderliness; a place for everything and everything in its place. I think I inherited my own bent toward tidiness and order from my German parents. Oh, wait, my parents weren’t German. Guess it’s just my slight case of OCD. Although my dad did rigorously maintain a very neat pegboard of tools that I was only too happy to rearrange. God forbid that any of my tools end up in a basket! That would be a basket too far. Otherwise, I’m okay with the basketizing of our home. I have to admit, though, there are a couple that have no clear purpose as far as I can tell. But I do know better than to try to move them. As a kid, I remember my mom having a sewing basket – I think – and maybe a couple more. She did have these plastic boxes with lots of little plastic drawers she kept her sewing stuff in. Dad favored empty coffee cans. But baskets are good things. They’ve played important roles in biblical history. Moses was set sailing on the Nile in a basket. The crippled man was lowered through a roof to be placed before Jesus for healing. Twelve baskets were used to collect left over bread after thousands were fed from only a couple of loaves. And Paul’s life was saved through his being lowered out a window in a basket. So I cannot begrudge baskets in my home. They do fit into the “green” lifestyle trend making us cutting edge in that regard. There are many baskets-in-waiting in the basement that I know will eventually make their way upstairs. They’re stacked down there like little viney aliens. And I swear they’re reproducing. My wife reminds me that you can never have too many baskets. She’s been talking about how we need to make plans for our deaths. I wonder if they have a basket for that? It does rhyme. But I’ll need one bigger than a handbasket because I’m not going there. G! Bad grammar leads to some bad-ish press. I’m always surprised when someone insists that being able to write well is not as important as it used to be. This astounds me when I hear it from another communication professional. The ill-wrought reasoning lies in the fact that we do so much communication now with technology and somehow this lessens the need for writing well. Rather, it’s more important to understand how to use the technology, gather data, etc. to build effective communication. Just recently in fact I engaged in a brief cuff up with someone over this issue. I took my soapbox stand proclaiming that being able to write well is essential to being an effective communicator. Their retort was, “What about speaking? As in speeches?” Even then, I rebuked, great speeches are first well-written. Another communicator overhearing this mini-debate chimed in with the popular mantra, “But communication is really a conversation among the participants,” as if this would knock me off my box. It didn’t. If you are inept with the language as a writer, you won’t be better as a lone speaker giving a speech or as a participant in a conversation. Writing well entails being able to think and reason well. It exhibits not only clarity in communication, but a concern and interest in the proper use of language and thought. Distilling the essence of a message into an effective 140 character Tweet takes skill and understanding. Just ask any ad copywriter or poet! Using fewer words to get across a big idea is daunting. It's not just about using fewer words. Not everyone can do it. But being able to write well can also save politicians from public embarrassment. Just a couple of days ago, a very brief item appear in The Plain Dealer. The new Cuyahoga County Executive, Edward (Ed) FitzGerald, was putting down his foot on his staff regarding the proper spelling and capitalization of his name. It appears the “g” was being lower-cased frequently. Given that his name appears on numerous legal documents, it is essential that it be spelled correctly. I agree. Any person having their name applied to a document deserves to have it applied correctly. “Be” for “been” could merely have been a typo; but an egregious one, still. But using “documents that does not conform” instead of “documents that do not conform” is a blatant error. It likely echoes the way the writer speaks. And it’s wrong. 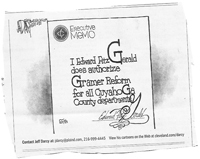 For those outside of Ohio who are not aware, Fitzgerald is the first County Executive. It’s a new form of county government which was enacted to replace and clean up an immense case of corruption that has brought down dozens of private and public citizens. So, everything FitzGerald and the county council do is under a microscope. Everything. Even without the added scrutiny, taking care that official public documents are crafted intelligently and accurately should be the norm. While not the case with the memo cited, sloppy writing could cost the county thousands of dollars because of an unclear, ambiguous, poorly written document that is challenged in court. In addition to damaged clarity and broken understanding, bad writing can cost taxpayers money! And it can put a ding in a public official’s reputation. So, yes, being able to write well is an essential skill for effective communication. If the person who wrote this egregious memo was not taught proper writing in school, they need to go back and smack their teachers. They were cheated! And Ed, you need to hire a writing coach for your staff. Disclaimer: Any typos or supposed errors appearing in my blogs are intended as entertainment and are not to be considered as a bad refection on my writing skills. Years ago, a watershed book came out called In Search of Excellence. Things have gotten crazy ever since. The book was full of great insights. It was a wake-up call for a lot of corporations to improve processes, decrease waste, increase profits, and become more employee friendly. Dozens more books on the same topics came flooding on its heels. The gold standard for manufacturing process – Six Sigma – came into vogue and everyone wanted to be a Black Belt. Whatever that was! Buzz me up with quality! Buzz phrases like continuous improvement, championing an organization, ISO 9000, Kaizen, benchmarking, re-engineering, and quality improvement process (QIP) filled business literature. Books, seminars, and conferences spawned consultants and programs out the wazoo. And then there were the absurd metaphors about cheese, being zapped, and more. “Huzzah! Excellence!” was the cry heard in office hallways everywhere. That was the holy grail of all our corporate efforts. Everyone wanted to win a Baldrige Award! Companies went to great extremes to squeeze out every drop of value and achieve an zero percent error rate. Whatever these meant! The wacky thing is that this feverish scramble for excellence yielded some really stupid behaviors. Probably because a lot of what was being promoted was based on improving manufacturing processes that relied on machines which didn’t always translate well when the “machines” were people. There were times when the pursuit for excellence backfired and merely wasted time, got expensive, burnt people out, and more. For example, working on a proposal for an aerospace company, the executive in charge wanted a full color glossy executive summary in the form a of large brochure. There was nothing in the RFP stating that this was a requirement or even desired by the organization we were responding to. But, the executive saw this as an “excellent” tactic. Sometimes good enough is good enough. Excellence can be an ambivalent target since everyone has a different idea as to what it is. In the case of the proposal, a normal, well-written, nicely formatted executive summary would have been good enough, and thus an excellent choice. What many mean when they say “excellent” is “perfection;” and perfection to a specific personally biased standard that may have no bearing on reality. Especially when it becomes so myopically focused on a single element of a project. When writing an article, even after it’s “done” it’s possible to tweak it forever; there’s always a different or better way to craft your sentences. But reality of deadlines says you’ve got to end it somewhere! Excellence as applied to work or any situation needs to take in the entire range of effort. To get an issue of a magazine out on time requires the completion of quality editorial copy, attractive design, and nicely done advertisements, among other tasks. Insisting that a specific article be re-written or a photo be re-taken until one person with abstract tastes decides they are “perfect” would cause the issue to be sent to the printer late causing it to be late to market – anything but an excellent outcome! Good enough does not mean something is done without care or quality. Rather, it means everyone involved has done the best they could given the time and resources available. Going in search of excellence doesn’t require following the path of perfection. Good enough yields pleasant results without killing the doers, overrunning costs, gratuitously missing deadlines, or stroking one person’s warped ego. There’s nothing wrong with good enough when that’s the best you can do. So, you’re an introvert? Why? Just stop it! I started reading this book, The Introverted Leader: Building on your quiet strength, some months ago. I haven’t finished it yet and probably won’t. Because it’s not really about how to be a leader as an introvert. Instead, it’s just another piece of propaganda, as the author puts it, to help you pass as an extrovert. What? Are you kidding me? The whole tone and overall implication of the book is that being an introvert is not a good thing. Instead of embracing who you are as an introvert, you need to pretend to be something you’re not – an extrovert. Refuse to do so? You’ll never succeed in a career position. This reminds me of the pre-integration years when blacks were told to look and act white to be accepted. That didn’t go over so well. Yes, introvert discrimination is real. Introvertphobia exists. We are free to be who we are – as long as we behave like extroverts. My suspicions about this book were raised in the preface when the author describes herself as “a strong extrovert.” Uh oh. She then attempts to claim credibility for authoring a book for introverts by describing how she’s been a business consultant for many years, worked with many corporate leaders, and is married to an introvert. So what? I hope she treats her husband with more respect than she does the introverted readers who are the intended audience for this book. This book is proof that extroverts don’t get introverts. The author’s approach is to offer tips to “fix” introverts. Just be more, you know, something else! There are dozens of books on how to succeed in a corporate setting. They all touch on topics such as how to assert yourself in meetings, how to find favor with your boss and co-workers, how to run projects, and so forth. This book is no different. The author has attempted to slant it toward introverts by jamming random quotes and toss-off tips aimed at introverts in between the generic business advice. The book is really about stifling your true personality as an introvert and covering who you are with the “acceptable” persona of an extrovert. It reinforces the negative stereotypes of introverts while quietly affirming the greater perceived value of extroverts. There is no guidance offered to help introverts navigate an extrovert environment, nor any insight offered to extroverts for accepting introverts as they are. What’s missing are tips for managers and others on how to overcome any anti-introvert bias. Discriminating against someone based on religion, ethnicity, gender, race – and personality style – is wrong. The same egalitarian attitude we hold regarding age and other discriminatory behaviors should be adopted when it comes to dealing with introverts. Or extroverts. We don’t need a world full of only rah-rah, in-your-face extroverts. We need a world that makes respectful room for the quiet, contemplative strength of introverts. Both personality types are to be valued and respected equally. Yet the entire book puts the onus on the introvert to conform and bend to extrovert behavior. Extroverts need to work just as hard to understand and accommodate their introvert colleagues. That’s true. It isn’t. A discriminatory attitude toward introversion is. What do you think about the "extrovert privilege" that exists in society and the discrimination against introverts?